Click the button below to add the Maui Ultra Fin Style PRO 17.5 Power Box to your wish list. The Style-Pro completes our freestyle range. More area and a thinner profile allow for early planing, very high speeds and a big pop for those very high moves. The ideal fin for New-School-Freestyling. * This graph is based on a body weight of 80 kg. Each 10 kg more/less the next bigger/smaller fin has to be selected. 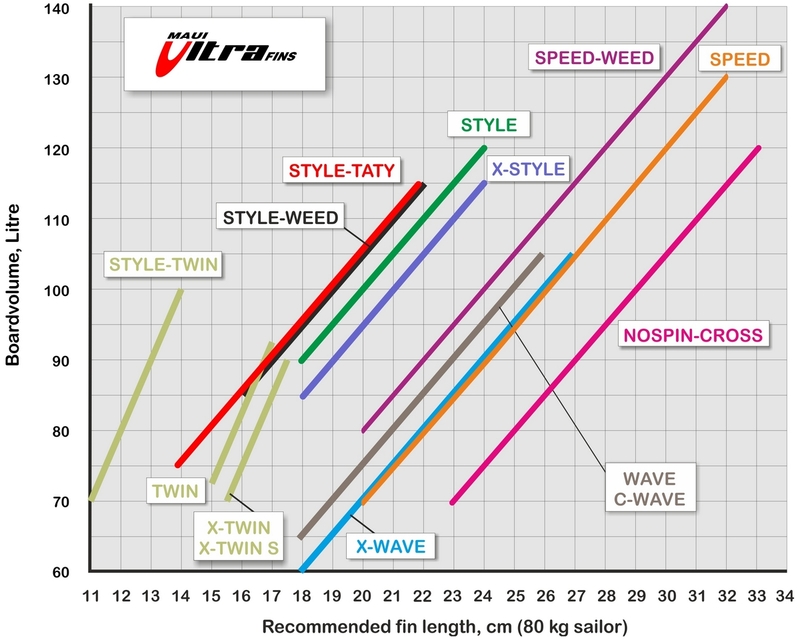 Sailboard performance and sailing characteristics are more influenced by the fin than originally thought. Simply speaking, the fin must hold a great part of the sail forces to create a stable and straight ride. Those fin forces must be provided under all sailing conditions and no spin-out should occur. MUFins airfoil design is based on highly sophisticated engineering methods as they are applied in aircraft wing design. But compared to aircraft wings, fins operate at a much more lower Reynolds number. That‘s why airfoils developed for aircraft wings like the NACA series - although widely used - are not really adequate for fin applications. In the last 25 years, especially in Germany, modern airfoils have been developed specifically for low Reynolds numbers. MUFins uses this valuable knowledge with some modifications for the new fin development. The airfoils are optimized with computer programs that can calculate all aerodynamic parameters of importance. This new approach in designing MUFins sets new standards in fin performance. MUFfins delivers unmatched stability and speed range, unbelievably upwind performance, they are extremely spin-out resistant, great in jibing and agile on the waves. Nothing else compares. One ride and you will never look at windsurfing the same again.